NEW YORK, NEW YORK – November 2, 2016 – GameChange Solar announced that its Pour-In-Place™ Ballasted Ground System was featured in a recent article published by EPA titled “RE-Powering America’s Land Initiative”. A former landfill in Ontario, California, is on track to become a solar field. The County of San Bernardino’s Milliken Sanitary Landfill is under construction to house a 3-MW solar installation on 14 acres.The installation will connect to an on-site substation operated by the California Independent System Operator, known as CAISO. 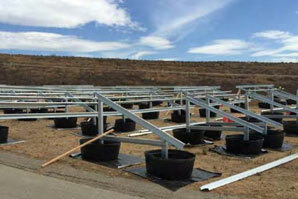 PV Navigator (PVN) a landfill-specific solar power development group, is developing the site. The company released an RFP for an Engineering, Procurement, Construction—or EPC—contractor for the solar. A small, local business was elected, Mangan Renewables, LLC. The company has mostly installed solar arrays on Costco buildings, and this is their first solar on landfill installation. The 196-acre Milliken site operated as a Class III landfill from 1956 to 1999, and the site was closed in three phases. The landfill cap was completed in 2005 and covers an estimated in-place volume of 25 million cubic yards of solid waste. The project uses a GameChange Solar’s round tub racking, which allows any drainage to have little to no impact. The solar installation is expected to employ 50-60 people at the peak of construction and is using local labor. PVN has secured a 20-year Power Purchase Agreement (PPA) with Southern California Edison (SCE), under which 100 percent of the electricity from the solar system will be sold directly to SCE’s grid. PVN expects to complete the Milliken installation around the end of 2016. This facility will help California achieve the state RPS goals set by the legislature and governor. This project can be used as a template for other solar projects within the state to be sited on closed landfills.